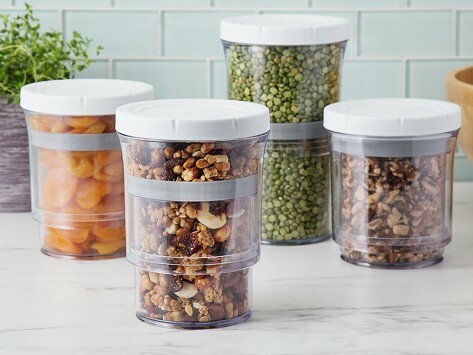 The airtight food storage container from Botto adjusts to take up just as much space as it needs, maximizing your cabinet and pantry storage and maintaining the freshness of dry foods. As you press the lid down, excess air comes out—and stays out—with one satisfying swoosh, thanks to a one-way air valve. Cereal, pasta, nuts and more will last longer and be tidily organized. Made with BPA- and phthalate-free, FDA-grade, food-safe materials.